A fresh, new year is upon us once again and we’ve caught up with our “chief geek” Martin McKay, our Chief Technology Officer and one of the founders of Texthelp, to see what his predictions are for educational technology in this coming year. What do you think the year ahead has in store in terms of educational technology? I think 2019 is going to be another great year for ed tech. One of the things we are continuing to see is IT costs continuing to fall. Access to technology is getting better. Fifteen years ago, Nicholas Negroponte from MIT was talking about a one laptop per child initiative, and he was trying to get the cost of computing down to about $100 per child. Many thought that it was a completely unachievable goal. If you go onto Amazon today, there are laptops available at that price, and they’re going to continue to drop. Laptops will continue to become more powerful, and that means that it’s going to be more reasonable for every child to have a device in school. It’s not like two years ago when Chromebooks were inexpensive and Windows computers were typically more expensive. Now Microsoft is releasing Windows Core next year which is going to be a super light and inexpensive version of Windows to run on cheaper laptops. Will big data/learning analytics have a major impact on education this incoming year? What are you doing to incorporate them into your software? Learning analytics has been a slow burner for a few years now, but 2019 is going to be the year that they take to the main stage. When we talk about learning analytics, we’re talking about measuring how students learn, not just how they use a piece of technology. Being able to look at things like how quickly students write, what the error rate of the writing is, what’s the maturity of their writing, how many spelling, punctuation and grammar errors there are, how long did they spend writing per day, all of this information will be invaluable. Over the last year at Texthelp, we’ve been able to create a set of national norms for writing for the US, and we’re planning to expand that next year to include Canada, Australia, and hopefully the UK, too. This means that teachers are going to be able to see how their students are writing compared to the national norm. Another technical trend we’re seeing, particularly in regard to assessment, is using technology and AI (Artificial Intelligence) to make ongoing, regular assessment faster and easier for teachers and also to try to take out some of the subjectivity from assessment. For example, if you give a student a writing task and you have 10 teachers assess that task, you’ll probably get 10 different scores. The technology we’ve been working on will not only create the national norms, but will try to remove some of the subjectivity from writing assessment using AI and statistical approaches. This will allow teachers to quickly and consistently assess writing. There is a big buzz around machine learning. How big a role will this have in education in the year ahead? Machine learning is incredible. It’s a hot topic everywhere at the moment and it’s going to be as relevant in education as it is anywhere else. Children learning how to develop machine learning technologies in class and then implement them is something that would have been inconceivable ten years ago – now it’s just the norm! What they can do in one day or even in an Hour of Code project is truly fantastic. For example, they can build their own machine-learning-based technologies on raspberry PI’s and Play’s at home. Google has also introduced a new thing called AIY – the Artificial Intelligence Yourself version of DIY, which allows the user to use kits and devices to build intelligent systems that see, speak, and understand. Then start tinkering. Take things apart. Make things better. See what problems they can solve. It’s very cool stuff. If you’re interested in finding out about our cool ed tech stuff, then be sure to stop by Texthelp booth #1545 at the upcoming 2019 TCEA Convention & Exposition. We hope to see you there. In the meantime, do you have anything else to add? 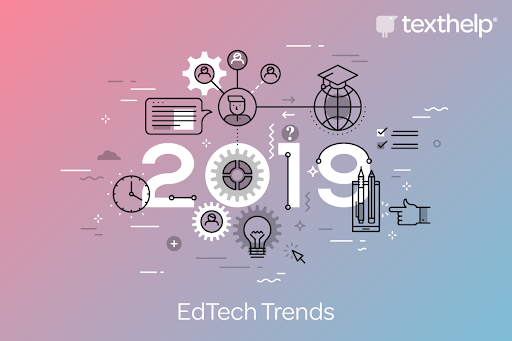 What are your ed tech trends for 2019? Tell us in the comments below; we’d love to hear your thoughts on this. This is a sponsored blog provided by Texthelp.